Screen is very strong economic, affordable and easy to use. Mine is Motorola G2 black colour. It has dual SIM with 16 GB internal storage and expandable to 32 GB which is much enough. Much good display due to Gorilla glass protection. Android version upto lollipop only no more system updates. Good product and value for money, but I strongly recommend to buy new generations of Moto since MotoG2 lacks 4G support. Good features and value for money. Overall it&apos;s very good. as well as battery is good. Good product and value for money, but I recommend to buy new generations since MotoG2 lacks 4G support. If you want to have a phone of good shelf life, this piece is the must! Though its may be an model now (compared to the further generations of the phone launched) , it is still worth using . 2. Auto HDR is the bet feature! 3.Very long battery life . 1. Though its usage can be last longing .. But it does not have a cool look. It is very simple is design. 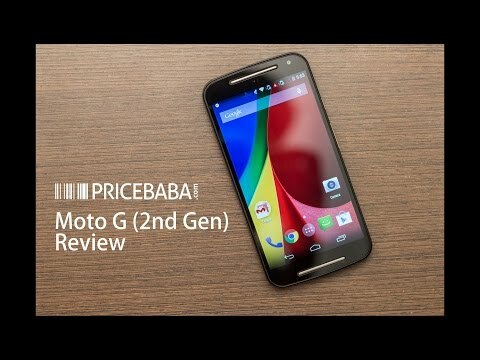 15 Pricebaba users have written their experience with Motorola Moto G 2nd Gen. If you own Motorola Moto G 2nd Gen, please do leave your feedback too. With more than 6.5 million units shipped, Moto G became the most sold Motorola phone ever. The phone offered stock Android and decent features at a very reasonable price. The major spec bumps that the Moto G 2nd Gen has over its predecessor is a bigger screen and an improved camera. The new Moto G sports a 5 inches LCD screen at 1280x720 resolution hence its pixel density is a bit lower at 293.7PPI. It also has a new 8MP rear camera and a 2MP front camera as compared to the 5MP and 1.3MP respectively, in last years version. The speaker that was placed on the back of the earlier Moto G is now on the front and one more speaker has been added. These stereo speakers will help improve sound output. Besides, the phone has 16GB of internal storage and Moto has also given a microSD card slot. It comes with 1GB RAM and is powered with a 1.2GHz Quad core Snapdragon 400 processor. The phone also offers dual SIM facility. Battery capacity remains unchanged at 2070mAh. This phone will directly compete with the Asus Zenfone 5. As the Moto G 2013 is discontinued, the phone is priced at Rs. 13,000 at launch.